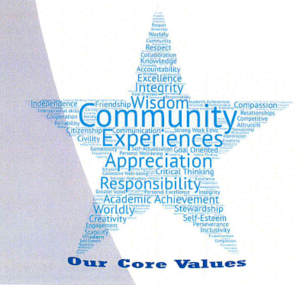 The School District of Waupaca is committed to excellence in education. The mission of the School District of Waupaca is to develop our students' capabilities and confidence to achieve their dreams and make the world a better place. The District will provide a safe, compassionate environment while using community resources wisely. The School District of Waupaca will ensure a high level of learning for all students through the implementation of a high reliability multi-tiered system of support by incorporating a safe and collaborative culture, effective teaching in every classroom, a guaranteed and viable curriculum, and target-based assessment, grading and reporting. The School District of Waupaca will implement mental and physical health programs on campus for students, staff, and families designed to decrease absenteeism and disciplinary actions, while increasing academic achievement and family engagement. The School District of Waupaca will provide career exploration based on students' needs and interests, including, but not limited to, mentoring, work experience opportunities, and career counseling. 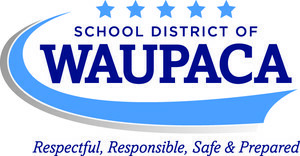 The School District of Waupaca will seek appropriate opportunities to increase collaboration and networking between family, business, and government. The School District of Waupaca will modify the school day's structure and schedule to best meet the needs of our students. The School District of Waupaca will foster positive relationships among our students, staff and community members through volunteering and mentoring programs. The School District of Waupaca will provide relevant learning opportunities for students, including curricula in life skills and financial literacy as well as learning platforms such as online, virtual, and charter to address different student learning styles.